Check out an in-depth review of the new 2013 Flex, an ideal SUV for families in Arizona. When you scroll down you'll find detailed information and vehicle specs, including details about the Ford Flex powertrain, cabin features, passenger space and more. There's a reason why many families have selected to drive the 2013 Ford Flex in Phoenix, Mesa, Glendale, Avondale, Tempe and several other surrounding cities. Find out why. Also find out if the Flex is right for you and your loved ones by reading a thorough review. Then, if you are interested in test driving the new Ford Flex in the Phoenix metro area visit Peoria Ford. During your visit, one of our sales associates would be happy to give you a complete tutorial of the Flex's features. Then you can put those features into action on the road. When you take your test drive, you can try out features like rear parking sensors, SYNC, and on select trims, heated seats, MyFord Touch and much more. To learn more, scroll down past the video. You'll find a useful list of quick facts about the Flex, followed by a comprehensive review. We're sure that after you learn a little bit about this family-oriented SUV, you'll understand why hundreds of families own the 2013 Ford Flex in Phoenix, Arizona. 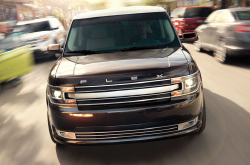 Compare the 2013 Ford Flex head-to-head with vehicles like the 2013 Chevrolet Tahoe, Dodge Durango, Buick Enclave and the Honda Odyssey, and you'll realize that the Flex outperforms the competition in loads areas. See our Quick List below to find out why! Take a peek inside the 2013 Flex - view video now! Don't travel to a national car repair shop in Phoenix when Peoria Ford's spectacular Flex experts are only a brief drive away from your apartment or house. We also furnish a extensive warranty on our jobs - more than most national shops do. The aces at our AZ Ford service center can be trusted to keep your Flex in athletic form for years to come. We handle strenuous, time consuming duties like transmission repair, as well as simple tasks such as conventional oil changes, brake pad replacement and a multitude of other special services. Make a secure choice when picking a worthy establishment to have your Ford Flex repaired, and keep in mind: At Peoria Ford you can look forward to hassle-free service and low-cost prices on Phoenix car repair. Get on the spot savings at the upcoming link. Click below to search for coupons! Want to test drive the 2013 Ford Flex near Phoenix? Then visit Peoria Ford today! Our dealership is located close to several cities including: Avondale, Glendale, Scottsdale, Paradise Valley, Tempe and other nearby cities. Make a stop at W Bell Road and N 91st Avenue to take a spin around town in the Flex - and bring your family! At Peoria Ford, exclusive specials are constantly popping up throughout the year, so make sure you stay in the know about what's happening at the dealership. Join us on Facebook or Twitter for notifications about when new specials and national incentives become available, including things like limited-time dealer cash, customer cash, 0 percent APR financing (for qualified buyers), employee pricing and other offers. With access to the most current OEM incentives and dealership discounts, you're sure to get the best deal possible on a new Ford Flex in the Phoenix metro area! To schedule a test drive, call us today or get in touch with us by filling out a quick online contact form. Also feel free to simply drop by any time during Peoria Ford's regular business hours.